The ultimate benefit is all the information contained inside the pages of this beautiful 331 page, hard cover edition of this fantastic book. But if you order "The 9 Steps to Keep the Doctor Away" today from this site, you'll get the following additional incredible bonuses, ABSOLUTELY FREE! Too many times we get a book with the best of intentions to read and benefit from it but life get's in the way. No more! Hundreds of people have raved about the 9S3 Program. Every 3 to 4 days, you'll get a very short email that will take less than 30 seconds to read, but will bring home an important concept from the book for you. It will also give you the page numbers in the book so you can read more about the subject in detail. People have absolutely been shocked by how they were pulled into the book by these emails and how this alone has made a difference in their lives. It's very powerful, far more than you can imagine. This one thing will absolutely ensure you will truly benefit from the information in this book, despite yourself. But you do have to "opt" in to get the 9S3 Program ... and it's totally FREE for you because you've bought the book here. But don't make the mistake thinking that just by reading these 25 pages, you'll get all the secrets and benefits of the book. You want to use this fast action guide but don't overlook the power of actually reading the entire book. In fact, just read the first few chapters and you'll see for your self...you'll be hooked! Use this Fast Action guide to get a jump on the 9 Steps. Each week, you'll get a 10 to 15 minute audio recording, taken from an interview or a presentation that tells it "really how it is". For example, in one of the first segments,you'll hear a candid interview Dr. Buttar did with TIME Magazine. During the interview, the reporter discloses to Dr. Buttar that she can never print the interview because...well, you'll be shocked by what she says. Each week, for over a year, you'll get a short audio that contains a secret that many people go their entire lives without knowing. This "Medical Secret Audio Series" is yours absolutely FREE! This online video series will present a "no nonsense" fact based presentation, which explains the basis of ALL chronic disease. In fact, Dr. Buttar uses this as the basis for how he approaches all chronic disease and as they say, the proof is in the pudding. 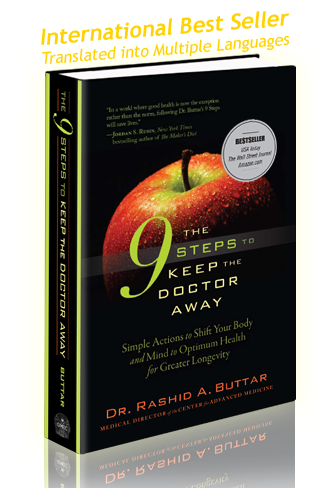 An overview of the Seven Toxicities, the subject of these 10 videos, is also presented in the book but the videos build upon the basic fundamentals presented in "The 9 Steps to Keep the Doctor Away". This is an hour and a half presentation given in front of an audience of 7 billionaires, more than 20 millionaires and numerous other successful individuals. You normally have to pay $89.00 to be able to view this to this online presentation but you'll get a password to access this video without any cost to you. This is without a doubt an ABSOULTELY MUST watch video. Yes, it will take an hour and a half but instead of watching a movie with your wife or girlfriend tonight, sit down and watch this presentation. I promise you that you will NOT regret it. It is truly THAT powerful. And you get totally FREE as a gift from me, just for buying the book! You'll also get a $20.00 coupon code to take advantage of the longevity and health secret discussed in Chapter 11 of the book (if you decide you want to try it...and for your sake, I hope you do). Already referred to as Holywood's secret weapon, this information will blow you away. In fact, it's so difficult to explain everything about it, I'm not even going to try to do it here. Suffice it to say that it's been on the market for over 13 years, has been registered with the FDA for 12 years, is all natural, has over 1,800 doctors in 27 countries that provide it professionally for their patients, is being shipped to over 70 countries now, has over 30 million doses that have been dispensed, was only available by prescription for the first 10 years it was on the market and has never had an adverse reaction reported (beyond a temporary rash over the site of application in less than 2% of people). Even more impressive, 83% of people using it stay on it because of what they experience, has a 100% money back guarantee, has a return rate of less than 0.25% (that's less than a quarter of 1%) which is unheard of in the health and wellness market and has 3 different medical studies done to validate it's effectiveness. How many products can you name that have this extensive of a history and yet, the world hasn't even heard of it yet? I guarantee you this IS the real deal. But don't take my word for it. Simply try it for yourself and then decide! You'll also have the option to receive a deep discount on a choice of ONE of 6 Award Winning DVD's, part of the "Know Your Options, The Medical Secrets". Each of the DVD's retails on Amazon.com for $89.55 but you can get any one for less than $18.00. Each DVD is over 90 minutes long and provides information that has led to thousands of lives having been saved...literally! And there will be other surprises worth literally hundreds of dollars which you'll receive over the next few months which you'll learn all about in due time. You get immediate access to all of this via a download link you'll receive in the confirmation email you'll be sent, once you've ordered the book. If you're still not convinced that your life is worth more than $23.95 cost of this book, then read the dozens upon dozens of 5 star reviews at Amazon.com regarding the book. With over 5 million organic results returned in a Google search under "The 9 Steps to Keep the Doctor Away", there must be something to this, don't you think? Enjoy this information! It has the power of literally transforming your life. This same crucial information can now easily save you and your loved ones TENS OF THOUSANDS OF DOLLARS in unnecessary medical expenses. Or you can save yourself the $23.95 and NOT order this book... the choice is yours!